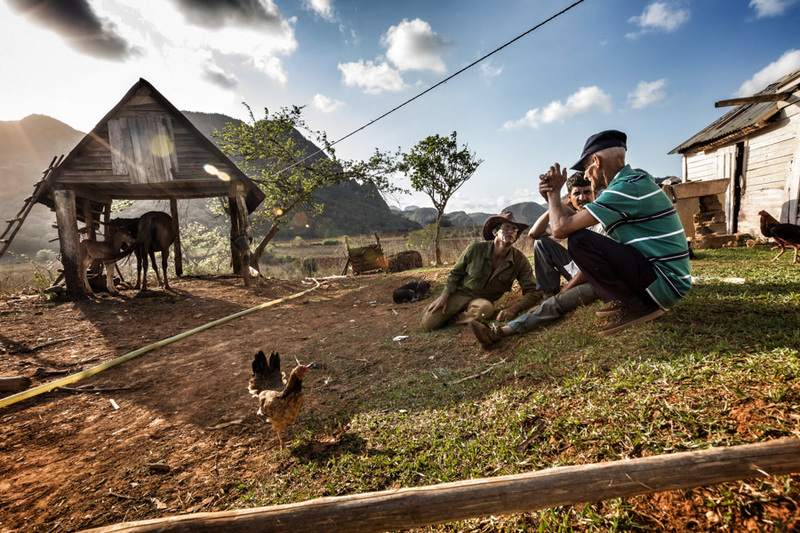 In May, I taught another of the photo workshops in Cuba, which I do together with my friend and colleague Sven Creutzmann. 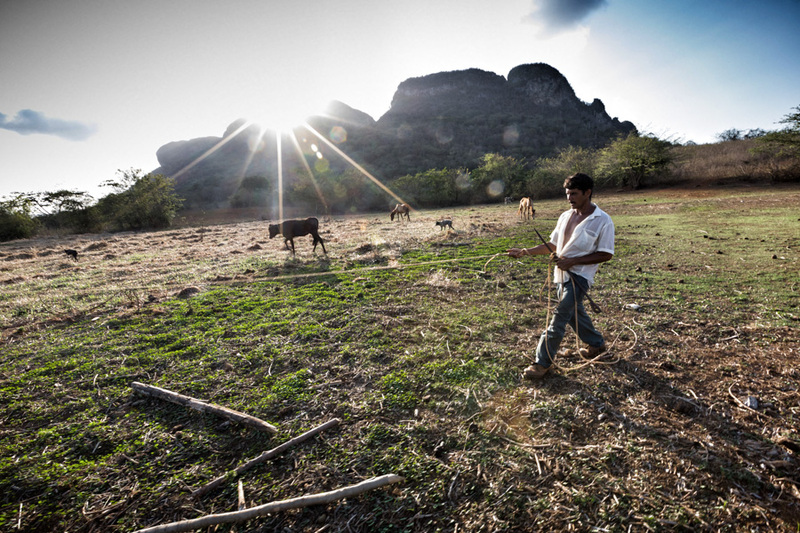 Before the workshop commenced we took a trip to the valley of Viñales in the western part of the country. There we visit the family of farmers I have followed for more than 20 years—and whom I have photographed ever since, as some of you who follow my blog already know. First recently have I been able to edit and process the photos from the trip. It’s just been too busy ever since—and then the summer holiday in there as well. 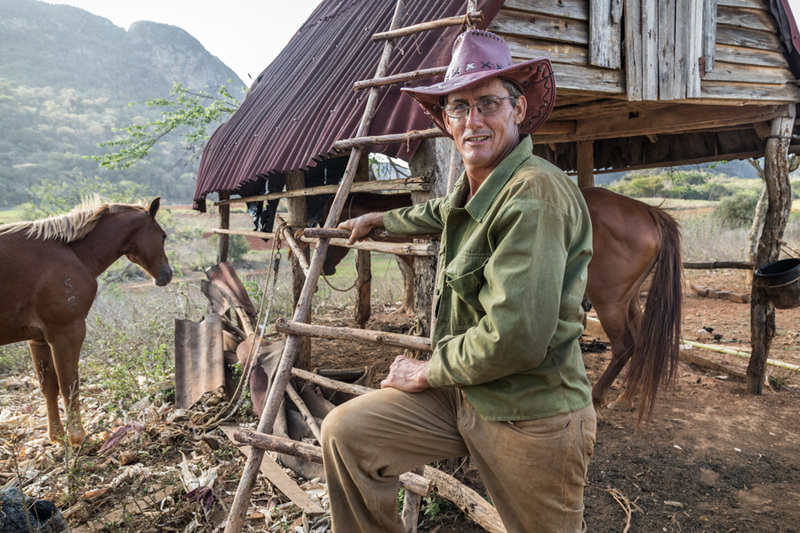 The family of farmers has become my own second family in Cuba. I don’t often have as much time to spend with them as I would like. But no matter how short the visit, I am always feeling at home and welcomed by all the family members. Today it’s two brothers and a sister who runs the farm, the children of the couple I started to follow first in the 90’s. Both parents are dead now, so the siblings have taken over, and the next generation is about to grow up as well. 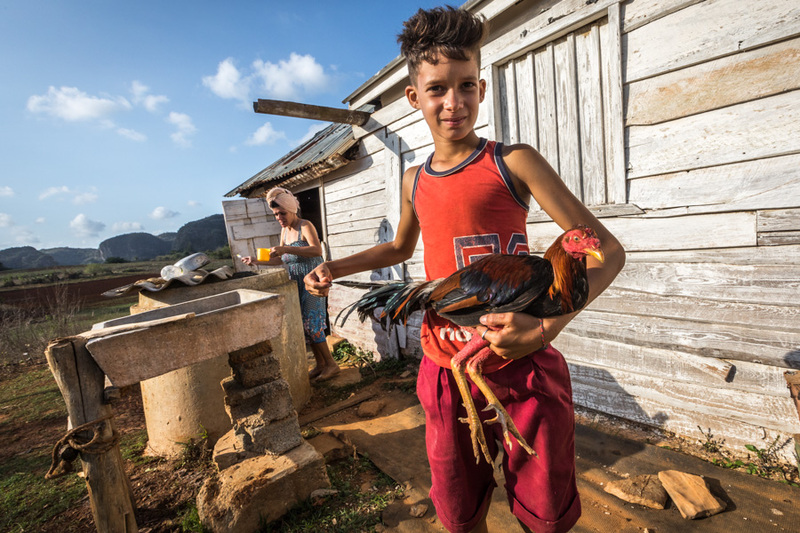 The family doesn’t have much, but lives off the land that they own, where they cultivate boniatos, yuccas, potatoes, tomatoes and tobacco, to only mention a little of their crops. In addition, they have a small livestock of cows, some pigs and lots of chicken and a couple of horses. It’s always a great joy to visit my family. It’s such a peaceful land, albeit also demanding. Their livelihood is full of hardship, but they nevertheless always have time to greet me and make me feel at home. They may not have much, but they always makes sure I can’t get away without eating with them and enjoy evenings around the farm. These are a few of the photos from this latest trip of mine. i love these pics, how amazing. cuba is somewhere i have always longed to visit. It’s a special place. Hope you get to visit Cuba one day. One doesn’t have to have much to still be happy. They look content. Thanks for the post. And thank you for the feedback, Craig. Certainly no home in Cuba would be complete without a rocking chair. How wonderful for you all to have a long history with together. Beautiful photos, as always! Thank you, Otto! I feel privileged indeed, to have this family as my family. Wow … such a powerful story and further evidence of my belief that the majority of the world is good. I believe you are right, at least the further you get away from anyone with power. I was especially taken with the photo of the man with the horses: partly because of the horses themselves. Those are some good-looking animals. It’s always enjoyable to see another set of photos from the farm, though I’m sure you see changes on every visit. Yes, there are always changes. The time before was just after their mother had passed away and the was much mourning. Now, a year later, their joy had returned to life. What a marvellous collection of images, Otto. So full of life and natural compositions. Almost like street photos in their spontaneity. Love the clarity and colours of the scenes. I do approach the family the same way as I do street photography. The big difference is of course that I know the family. How cool Otto to have known this family for so long and to have spent so many years with them. The photographs are beautiful. When do you return to Cuba? I’d love to see more of the island. I am planning another workshop around November and December, so I hope that will be my next return. I think it’s fantastic that you have had a sustained connection with this family over the years, Otto…. I love that you view them as family, and they obviously feel the same. I do and always enjoy spending time with them. What a lovely thing to have ongoing, will you make a book for them some day of all your pictures of them? Wonderful photos, Otto. 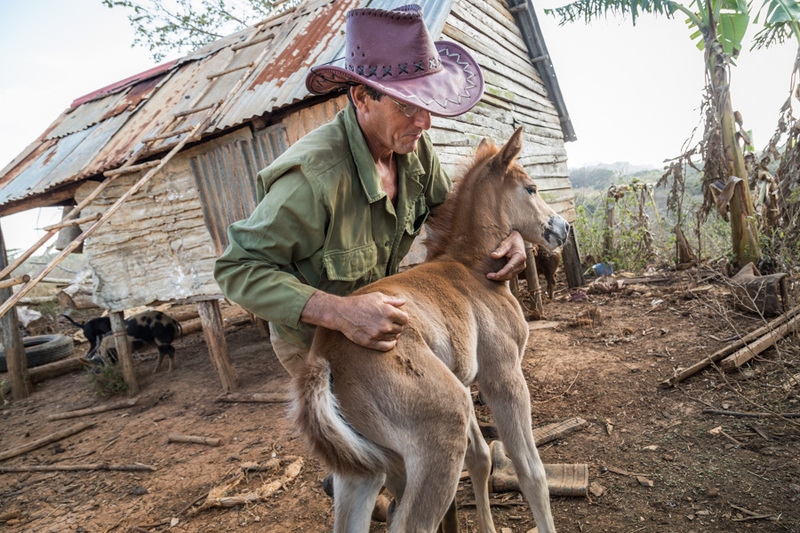 For some reason I haven’t associated horses with Cuba—until now. Thanks for opening my eyes. Just wonderful moments, Otto, captured in your special way. I agree with the commenters in everything, and I hope you will make a memory book for the family. One day I hope this may turn into a book, too. Everyone looks happy and that’s the most important thing, though to be honest, it does look like a lot of work. Wishing them the right amounts of sunshine and rain for a good harvest. Thanks for sharing your experience! Yes, lots of hard work. At least the climate is pretty steady in this area of the world. Up until now, at least. This is a favorite scene for me Otto. These lovely people so welcoming, so down to earth. Such big smiles and happy faces, I hope they remain happy. It’s very moving. Yes, it does, we all face hardships but that beautiful smile warms the heart. How heart-warming. Poor people but not unhappy…it seems. I often find poor people more happy than the rest of us, as long as they don’t starve or circumstance are unstable. Wonderful captures of your family. Love the picture of the boy holding the roster. I love your storytelling through your images, Otto. How wonderful that you’ve maintained this warm relationship with your family all these years. Your affection shines through in your photos. I am touched by your words, Jane. Thank you. Otto, how wonderful, that you have this Cuban family and what blessing for them and for you. Your images portray all the closeness. I am happy that it shows. Thank you, Cornelia. I really like your lead-off image for this post. Great pics! What a different world. Thank you. Yes, it’s different than most places in the world. a fine collection of their everyday lives. i would call it documentary; and it is, but that seems cold, does it not ? at any rate, a fine collection of life. you controlled the harsh light very well. As I am a documentary photograph, I don’t mind my photo going into that category. 🙂 Thanks for the comment, Sherri. 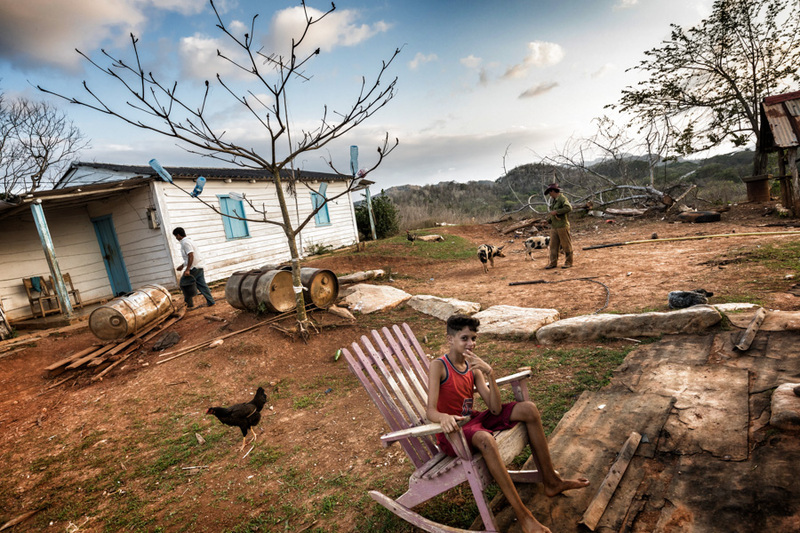 Lovely images of your Cuban family. The hard life shows, but so does the heart. What beautiful, intimate images you’ve captured. As so many others have commented, it looks like hard work but what you really come away with is the beautiful spirit of these people. Gorgeous work, Otto. They look like pictures not just of a different land, but a different time. They look like nice folks, not surprised to hear about their hospitality. I had to look up “boniatos” – – a white sweet potato? Do they really taste like roasted chestnuts? Bonitaos actually taste more like yucca in my opinion—kind of like extra dry potatoes. They make for excellent and tasting chips. Thanks for commenting, Robert. What an immersive experience Otto, it sounds as though they really embrace you into their family. Lovely photos. I do think the feeling is mutual. Thank you, Miriam. Lovely post and photos. I love the lighting. It seems like each image was blessed with fill light of some sort. The images of the people with their critters really reach out to me. But also, that Adirondack chair…. Are you finding many things changing very quickly since the US (supposedly) opened ties with Cuba? Beautiful tribute to a land and family you clearly love ~ the third shot is so perfect: composed/framed so beautifully, perfectly for the scene and your words. I’m a more rural type of person, so I feel very much at home even though it is not an easy life with so much hardship, it is a noble and proud life…I love it. Also, I can connect with your emotion of having a “family” elsewhere, as in Asia/Hong Kong I’ve got family that opens up new worlds for all involved. Beautiful. Thank you so much for those lovely words, Randall. I have seen your images from your other world, and they are stunning—as are the photos from the US west coast. There is something special about the humble and yet proud life many not so wealthy live, isn’t there. It must be wonderful to have this contact down so many years, Otto. 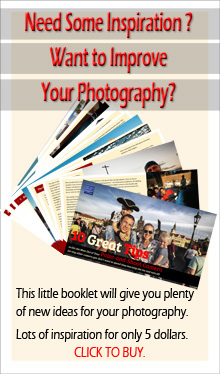 As well as nourish and befriend you they’ve provided a rich source of photography. 🙂 🙂 Have a good weekend! Thank you for the lovely feedback. Have a wonderful weekend yourself, Jo. These are just wonderful …magic place! How lovely to be able to stay here with your Cuban family! 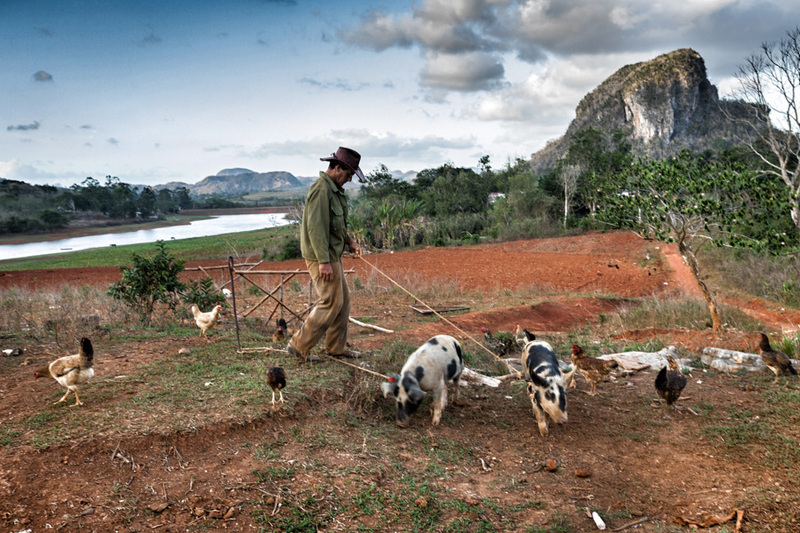 Really nice to see some different images of Cuba away from the hustle and bustle of the city. It is so nice to be able to know some real locals and see how most of the country lives. Great images! Thank you for the feedback, Syd. I do understand that desire, although I have come to embrace the fact that I am a city boy. It is good to learn those things about oneself! Yes, I do remember you posting about these farmers previously. These shots are even more impressive as you’ve captured them interacting with their surroundings. Not just their farm, but the landscape. You inspire strongly bucolic feelings. I like to try to make the environment part of a story in most of my photographs, so I am very happy this is how you see these photos. Thank you, Allan.